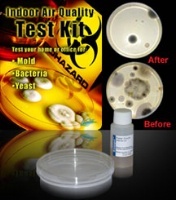 Microbial (mold, yeast and bacteria) air quality test kit for before and after. Have you tested the air quality in your home? Most indoor allergies are not caused by pollen and other large particles. Larger particles quickly settle out of the air, decreasing your chance of inhaling them. The biggest culprits for allergies and sinus infections are mold and bacteria. To improve your health you should test your home often for mold, bacteria and yeast. The Air oasis Indoor Air Quality Test Kits are the easiest way to test your air. To use the microbial test kit, pour the entire contents of the Easygel bottle into the petri dish, being careful not to touch the gel inside the bottle or petri dish. Gently rock the petri dish to ensure the gel is distributed evenly across the entire dish, then leave the petri dish uncovered and undisturbed for one hour in any area you suspect of having microbial contamination. When done, place the cover on the dish, seal it with tape and place the dish in a warm area with little to no light for three to five days. When you review the results, shiny white spots are bacteria, shiny yellow to red spots are yeast and fuzzy white to black spots are mold. Each air quality test kit contains two test petri dishes and two bottles of Easygel. This air quality test kit will give you a good idea of general air quality in your home. IMPORTANT NOTE: When doing a before and after test, it is important to do both before and after cultures from the exact same location, otherwise you will not have an accurate assessment of microbial reduction. 8/31/2014 – Does this product have any antimicrobial properties or does it only filter particulates and odors? I would like to know the shelf life of your product. Looking forward to your reply. Thank you.